During the earliest stages of cancer, physicians often have difficulty detecting it because there are too few circulating tumor cells to find in the blood. Cancer can give hints of its presence through specific proteins that appear in the bloodstream, but even then, these cancer “signatures” may be so few in number – about a million to a billion times lower than other proteins in the blood – that they can go undetected. Many cancer diagnostic tests – such as the prostate specific antigen-based screening – don’t work well until a cancer has proliferated enough to present itself in large numbers in blood tests. By then, the cancer is advancing and possibly already dangerous. So scientists are continually looking for better cancer tests, ones that could quickly detect the cancer’s telltale presence before it takes hold. 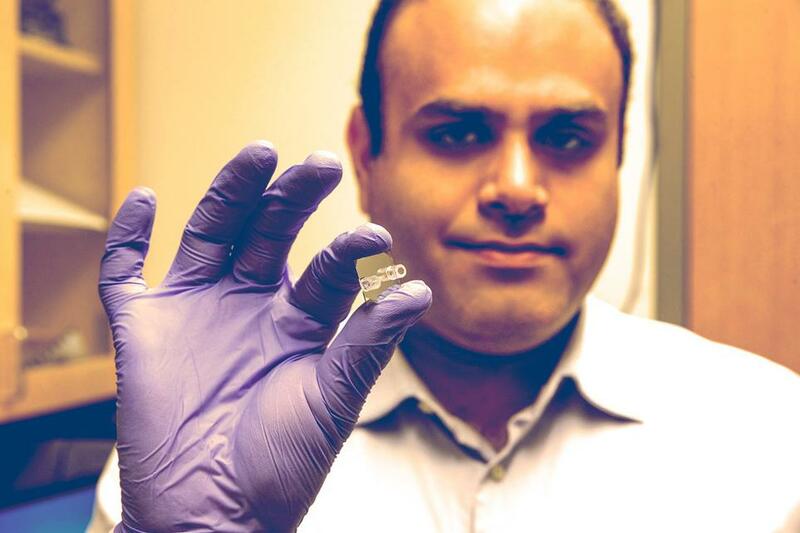 Ali Rohani, a University of Virginia graduate student in electrical engineering, and his colleagues in several UVA School of Medicine clinical groups and the School of Engineering and Applied Science may have found a way to find the earliest signs of prostate cancer with a small lab-on-a-chip-type device they are developing. It’s a way to pick through the sea of normal proteins in the blood to find the relative few that are associated with prostate cancer. Rohani – who leads the project under the supervision of Nathan Swami, an associate professor of electrical and computer engineering – calls it “finding Waldo,” as in the “Where’s Waldo?” game for children. In books and online pictures, a character named Waldo is hidden among tens of dozens of other characters. Players are challenged to find Waldo among the masses by identifying his unique characteristics: his hat, glasses, shirt and other features. Rohani is looking for his Waldo by identifying the characteristic electrical properties of the prostate cancer protein because, like other proteins, it has its own distinctive “chemical topology” and shows itself under a specific set of frequencies. Rohani uses his specially designed nano-device chip to create a salt-depleted region within a high-salt clinical serum sample by applying finely tuned electrical signals – signals set at the specific frequency to stimulate prostate cancer proteins. This creates what he calls a “black hole” on the chip where all the prostate-specific protein is concentrated and trapped in a specific area, while all other proteins are kept outside of that concentration. This allows Rohani to find the specific protein he is looking for, even when there are only trace amounts. This ultimately would allow detection of cancer at the very earliest and most highly treatable stages of development. “Our device speeds up detection about 100 times,” Rohani said. “By enhancing the trapping efficiency of cancer proteins by up to 150 times over the current state-of-the-art technologies that enrich these proteins by using antibodies, we have achieved more than a 250,000 times increase in the local concentration of rare prostate-specific antigens, and have successfully detected them under conditions very similar to early stage prostate cancer. Rohani noted that the localized enrichment and selectivity features within his nanostructured chip help to prevent both false negative results during early cancer stages, and false positives of recurrence or relapse after treatment – both problems of current cancer diagnosis techniques. “We envision that all we will need for a bright future for diagnosing cancer will be a single drop of blood and 10 seconds of detection time on our device – no harder than treating a common cold,” Rohani said. He is looking to create a start-up company centered around the new technology. Early results from the research were published late last year in the journal Lab on a Chip. This study is ongoing in Swami’s Nano Electro MagneticS lab, in collaboration with Lindsay Bazydlo, a professor of pathology.